The P330i is the newest generation of the popular card printers made by Zebra - already tens of thousands have been installed globally. Developed for demanding environments, the P330i is reliable, powerful and suitable for large quantity printing. Additional networking and encoding options offer high flexibility and allow highly specialised applications on a professional level. For ID cards, customer cards, name tags, etc. Using original Zebra consumables, you can create individually designed plastic cards with vivid, realistic colours in professional quality. Retail EPoS Systems offers a large selection of ink ribbons and plastic cards. You can create personalised employee cards as well as especially attractive customer retention in full colour. 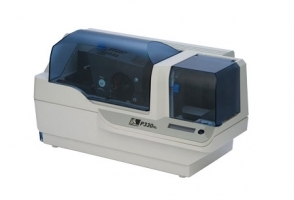 We also offer the low-cost P330m version, the professional card printer for price-sensitive market segments. With the appropriate ink ribbon the P330m produces cards in only monochrome and therefore is ideally adapted for customer and identification cards. The easy-to-use architecture of the high-performance card printers from the P3xx series opens up new possibilities the standard supply of 100 cards is covered by a transparent lid that allows users to anticipate reloads even while the cards are printed. If that is not sufficient, an optional card loader for 220 cards provides almost interruption-free production. The patented angular card loader guarantees a low amount of rejected cards during production and the self-aligning print head allows consistent printing quality without complicated user adjustments. The 16 character LCD display informs users of configuration and consumables status. Easy access to the ink ribbon is achieved by a print head that opens widely, which makes it easy to perform maintenance work even for untrained personnel. A USB interface provides seamless plug play integration into existing customer systems. Optionally, customers can also choose a combination of USB and Ethernet interfaces. Please complete the form below to request a quote for these products. Be the first to submit a question, use the form below. Thank you for completing the 'Get in Touch' form. A member of our team has received your request and will be in touch soon. Yes, by checking this box, I would like to receive Offers / Promotions & News. You will have the opportunity to opt out of receiving communications from us every time we contact you. You may also wish to read our privacy statement that provides further information about how we use personal data.